Whisper Number - What Does It Mean? What is a "whisper number"? 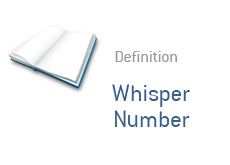 What is the definition of a "whisper number"? Use of the term "whisper number" has faded substantially over the past 5-10 years. During the height of the dot-com boom, CNBC and others would breathlessly report about a company's "whisper number" and whether or not they had hit it. Analysts who are following a company will publish their official earnings estimate for upcoming quarters. Numbers from different analysts who follow the company are averaged together to create a "consensus earnings estimate". Many companies purposely try to lower analyst expectations for future quarters so that they can easily beat expectations. Beating expectations usually results in a stock trading higher. If a company fails to manage expectations and ends up missing the consensus earnings number, then their stock will usually fall and momentum in the stock will be squashed. This is where the "whisper number" comes in. A "whisper number" is an unpublished earnings number that many people believe that the company will post, regardless of what the consensus earnings estimates are. Google is reporting Q3 earnings after the bell, and the consensus estimate is that they will have 45 cents per share. The "whisper number" is actually 51 cents a share, meaning that Google could post earnings of 48 cents per share and still trade lower, due to the fact that they missed the "whisper number". What is a "Whisper Number" And Why is it Important?